The concept for this series originally came about in 1998 or 1999. After some earlier experiments with the incorporation of text into my painting, I decided to explore the idea of veneration via the process of painting directly on book pages. My admiration for the various figures portrayed was often gained by reading their letters, notebooks, or published writings. Since, for me, they each took on the role of a type of personal saint, the expanded format of an altarpiece or reliquary was a natural match. Not only did it take a few years to digest just what influences and texts from each individual were essential to the pieces, but the reliquary objects needed to be established and then found. 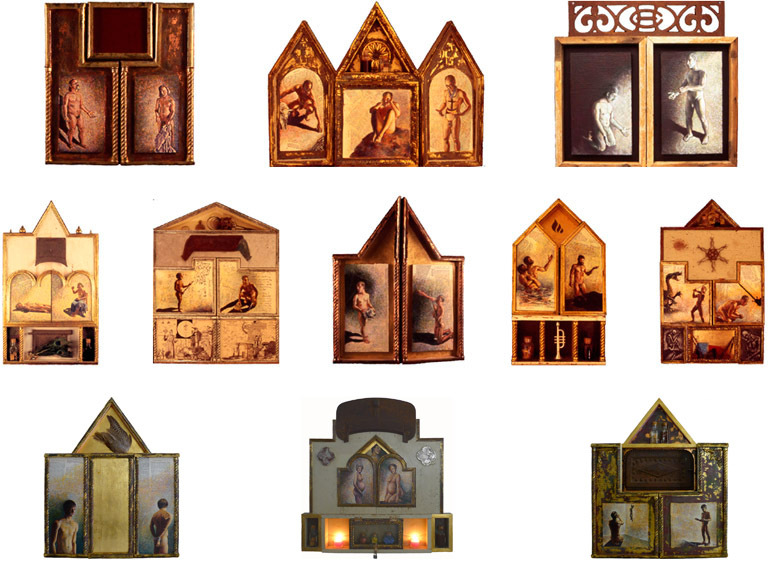 These represent some of original twelve "personal saints" altarpieces. Over time the altarpiece concept has evolved and the new works, many currently under production, are not based as much on individuals but on broader concepts or themes. The constructions and interactivity continue to increase as they are influenced more and more by the box constructions of Joseph Cornell. Details about the production of these works can be found at Tyrus' Eye on Art.